You’ll still catch owner David Bartlett playing his favorite machines. 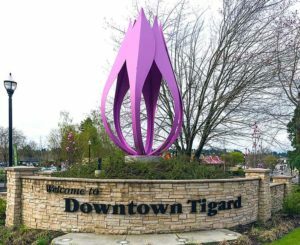 The city of Tigard is a region in constant flux, but no more so is this true than right now. 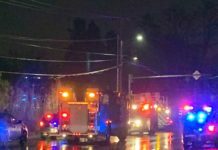 Downtown Tigard, Main Street in particular, is currently experiencing a boom that could cement Tigard’s place as a bona fide destination for your next night out on the town. No longer are there limited options for late night fun, and no longer are those options going to be limited to bars and restaurants. 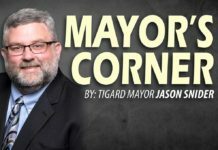 No matter what your idea of fun is, Tigard is well on their way to being able to accommodate everybody looking to have a good time. 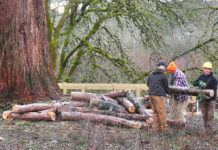 If you’re looking for something to do to occupy your time or relieve some boredom in Tigard, you’ve now got an assortment of options. 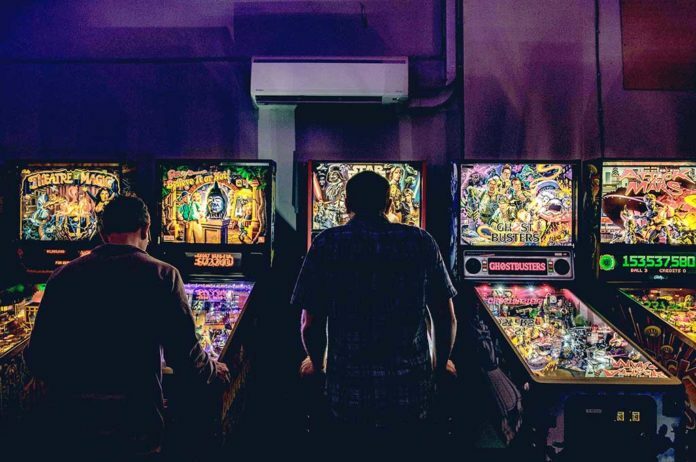 Tigard Bowl, Archer’s Afield, and Paddle Palace all have been staples to Tigard’s gaming options—but what about all these new entertainment options? 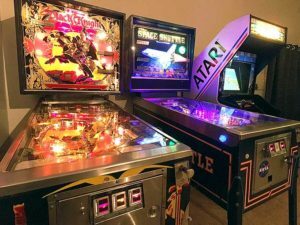 Did you know that Tigard just opened a retro pinball arcade? Or the new board game shop that promises not to leave you bored? What about the escape room that is so busy they haven’t even needed to post signs? 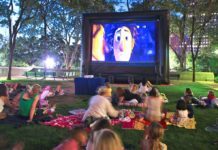 We sent our resident reporter to check out the newly opened entertainment options sprouting up on Main Street. Upon first entering Arcade Club PDX, my first initial thought was “Am I in the right year? Is it 2019,” which is reasonable, considering “Gremlins” was playing on the wall and I was looking at “Pole Position” machine and a tabletop “Cosmic Guerilla” game. Turns out, it really was 2019, Arcade Club just does an excellent job at reminding you of the excitement of yesteryear. This is why when you first walk in, Wham might be playing on the jukebox, you can hear the crashes, bells, and whistles of the pinball machines in the back, and you can expect a random ‘80s movie to be projected on the wall. If anything, you feel like you just walked into a time capsule that led through your high school buddy’s family basement. Pinball requires the sort of laser focus seen here. 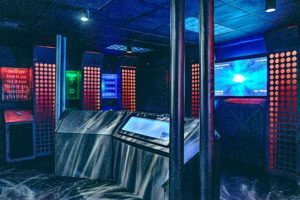 The sense of youthful enjoyment is present from anyone who visits Arcade Club, regardless of their age. Whether someone is challenging their childhood high score on “Super Mario Bros.” or discovering the new “Star Wars” pinball, you can almost bet that they have a wide grin pasted on their face. Which leads to the question, what led David and Sarah to choose the arcade business? Surely, there had to be a reason. 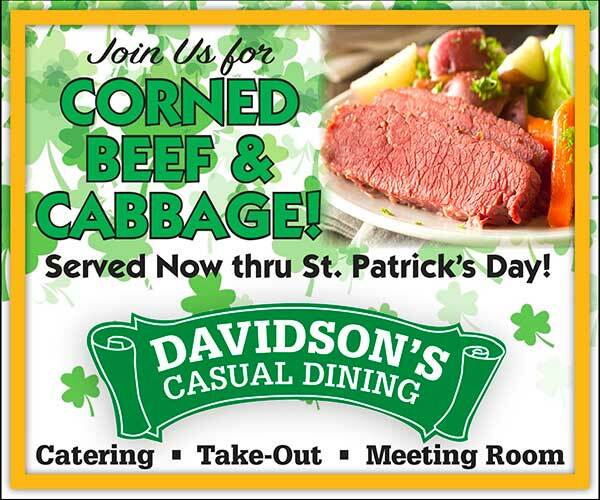 All of the classics can be found here…. no secret handshake required for the scoop. The answer is short and sweet: “We wanted to create a place for kids to come inside and hang out, instead of being out getting into mischief,” says David. As times have changed, so have our entertainment options. Nowadays, entertainment can be limited to the devices in our pockets and can seriously limit the socializing and creative fun that kids experience these days. A pocket full of quarters is all you need to have fun when you come down to Arcade Club PDX. Speaking of quarters, during our visit, one customer was so enthralled with their gameplay that instead of being sad that Arcade Club doesn’t take debit/credit card (not yet, anyways), they simply found the nearest ATM across the street and came back moments later with fresh cash. In the future, card will be accepted and you’ll be able to game for as long as they’re open. What does the future hold for Club Arcade? 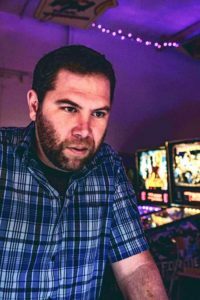 As much fun as the walls will hold, there are talks of adding food, new machines, hosting tournaments for pinball, “Smash Bros.”, or any other games that the community is interested in playing together. As for the existing games? They will remain mostly intact, with some game swaps happening on a regular basis to ensure that there is always a fresh selection of games for players to choose. So, when you walk in the door, all you’ll need is a pocket full of quarters and a few free hours to have the time of your life. Tate’s welcoming and calming demeanor is matched by a passion for the games surrounding him. The first impression upon entering Versus is how nice the shop looks. 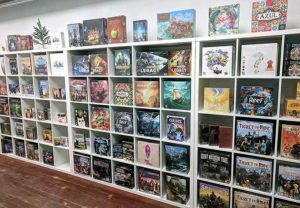 The interior of the store is crisp and clean and beautiful, adding on to the existing allure of the brand-new board game shop on Main Street. I know what you may be thinking, “board games? 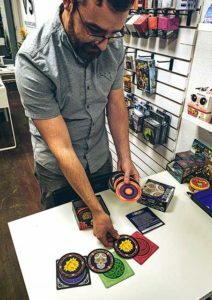 How popular can those be?” Turns out, the board game industry is a $1.5 billion business and Versus Games is the newest in a wave of expanding game stores opening up across the country. As I walk in, owner Tate Breswick is sitting behind the counter/desk, logging a sale from a happy family who was just purchasing a new game to keep them from getting bored. 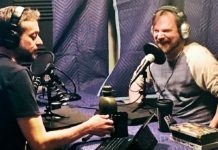 Friendly and disarming, Tate is the perfect person to explain the board game phenomenon to you. I, myself, have only ever played 2 or 3 board games and had no idea the industry was booming. Being a novice in this store has rich benefits, though. As you get to learn about the expansive world of gaming that exists right now. Whether you are into card games, traditional roleplaying games like “D&D”, turn based games such as “Monopoly”, or just like getting together with friends to enjoy yourselves, there is truly something for every age group and demographic. Just a sliver of what you can expect to find if you’re looking for a new way to beat the boredom. In the future of Versus Board Games, there will be plenty more to do, as well. 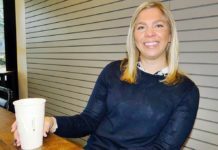 Tate detailed: “We plan to open a small kitchen and a taproom, we’ll serve adult beverages along with sandwiches, pizza, all the regular casual food. 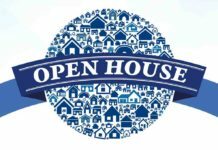 We’ll also have a full game library up there and host game nights where we all play the same game.” Whether it’s trivia, playing through one of the board games together, or regular card games—you can always count on something happening upstairs when the tap house opens up. As far as the regular storefront? You can expect more tournaments, more in store game play, and soon there will be a room in the back dedicated exclusively to game play/tournament usage. Versus Board Games owner Tate Breswick is still finding joy discovering new games, seen here showing off his latest favorite. In the meantime, though, Versus shows no signs of slowing down business. In fact, Tate has high hopes for the store. When asked about what the future of Versus looks like, Tate made the answer simple. “I’ve read about this concept called ‘The Third Place’, meaning that we all have three places we go—home, work, and a third place. 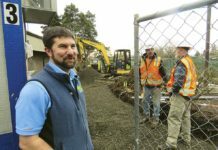 I want Versus to be that third place for Tigard residents.” When you have an inventory that’s suited from ages 4 to 94 and there’s no such thing as “typical customer”, you can expect that Versus will become the Third Place for many, in the years to come. 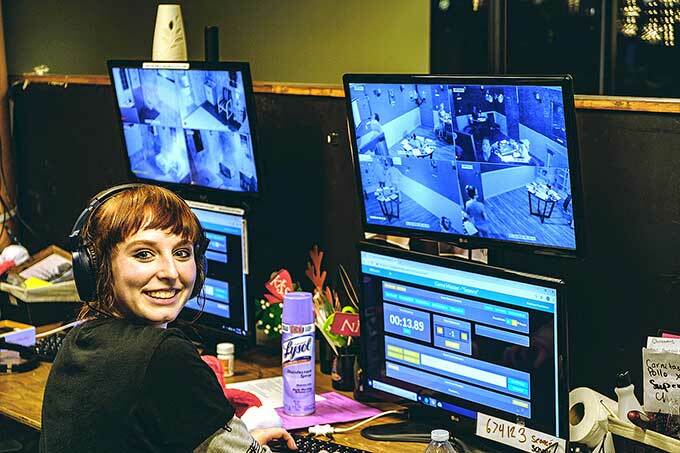 Just one of the many smiling faces who act as game master and run the show from the control room. The post-holiday boredom has a way of running rampant after the holiday season, after the pretty lights get taken down and everyone goes back to school or work, everyone needs an escape from the monotony of regular life. Stumptown Escape Games offers folks of all ages the opportunity to participate in a game that requires teamwork, critical thinking, and participation from all parties involved—all while in a warm and welcoming environment. 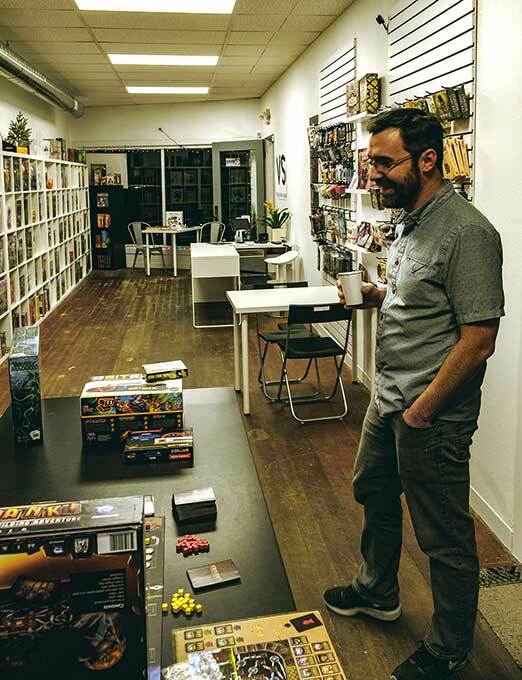 Stumptown Escape Games owner Matt Hutchinson is the proud proprietor of Stumptown Escape Games and you’ll often see his smiling face in the lobby. 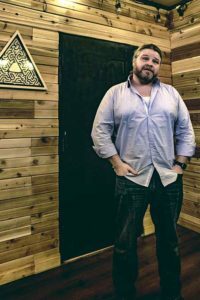 For those who aren’t familiar, Escape Rooms are a simple concept: you are locked in a themed room and have a set amount of time to use the clues hidden in the room design to unlock the room, thus winning the game. The room designs vary room to room, with Stumptown offering four designs—A rustic Oregon “cabin in the woods,” a room inspired by Nikola Tesla’s personal lab, an intergalactic spaceship theme, and a room centered around occult themes. All of the rooms are monitored via audio and video recording, with a television displayed in the room to let players know how much time is left/help guide the game along. Inspired by all of your favorite intergalactic spaceships, this room is a personal favorite to Stumptown employees and players alike. How has business been? Matt has a simple answer: “We haven’t even had to put signs up yet, that may change a little after the holidays when we enter the slump, but we might even be able to hold off, we just keep filling these room.” In the meantime, Matt and company have no plan of slowing down… In fact, there is an interest in a possible secondary location, to open up more rooms (remaining local to Tigard, of course). 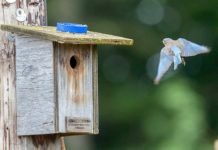 So, if you’re feeling bored and need an escape this winter, escaping the boredom might be simple, but good luck finding your way out of the rooms. 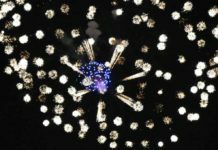 Previous articleDance Like a Star! 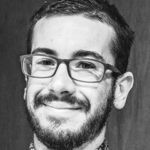 Zackary Perry is a Portland born writer and photographer who has traveled the world, taking photos and writing the captions. He attended Arts and Communications Magnet Academy and has a passion for music, food, and storytelling.